What grass seed mixtures is best for my horse paddock? Firstly you need to ask yourself “What do I want from my horse paddock?” Do you want a paddock which offers plenty of grass for a hay cut? Or perhaps you want grass for grazing your horses or ponies. When you find what you want from your horse paddock the seed selection is easy. Perennial Ryegrass 50 Produces a dense hardwearing sward with a high leaf content. It has aggressive growth and will tiller out well. Creeping Red Fescue 25 Small amount of this provide creeping fibrous roots. Timothy 12.5 Ideal for horses as it is very palatable. It tolerates wet conditions extremely well. Likes heavy soil. Meadow Fescue 12.5 Offers an early spring growth with a regrowth consisting mainly of leafy shoots. Ideally many equestrians would prefer a grass seed that is both useful for hay and provides a good base for grazing. We recommend sectioning off your paddock with one small section producing high yielding grass for hay whilst the other section offers nutritious grass for grazing.Getting the Best ResultsThe best time of year for establishing seed is March - April and from last week July, August or mid-September at latest.. Before sowing ensure the paddock is prepared by pH testing the soil, draining of heavy soil if required and removing weeds and stones etc. This will give the seed the best chances of growth. If sowing a new ley a rate of 12kg of seed per acre is recommended. Check out our Bulk Ordering section which will allow you to get the best value for money.Want to know more? 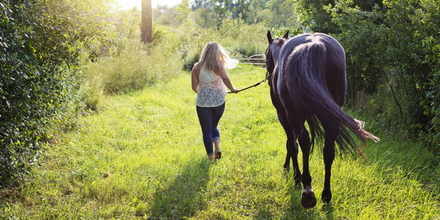 Have a read our guide to maintaining a horse paddock.